Conservatives in Congress are looking to scale back federal Medicaid expenditures and patient protections, including the robust investment in and requirements for family planning services. State legislatures and Medicaid agencies can and should step in to preserve, and even strengthen, many of the current federal protections to ensure that low-income residents have comprehensive coverage for the family planning care they need. Conservatives in Congress and the Trump administration are working to fundamentally restructure Medicaid in ways that could undermine coverage overall and for family planning in particular (see “Why Protecting Medicaid Means Protecting Sexual and Reproductive Health,” 2017). States can and should take steps to preserve Medicaid’s coverage and protections for family planning services, and even make this coverage better for the millions of low-income individuals who rely on it. Federal law, along with federal agency regulations and guidance, includes strong protections for Medicaid enrollees that are designed to ensure they can choose contraceptive methods and other family planning services that best fit their needs, without financial or administrative barriers. These protections are in danger at the federal level, such as through potential changes to regulations and guidance issued by the Centers for Medicare and Medicaid Services (CMS) or through legislation that could convert Medicaid into a block grant program, which would eliminate a vast array of protective federal Medicaid rules. States can and should work to counter this danger by codifying these protections into their own laws and regulations, and in the process, take the opportunity to make them even stronger. States should codify the requirement for Medicaid to cover family planning services and supplies. Moreover, they should go beyond that by requiring that all Medicaid enrollees receive coverage for all contraceptive methods. That should include the 18 methods currently used by women, as well as the two methods—vasectomy and male condoms—used by men, along with any future methods. States should also specifically include coverage of methods provided over the counter without a prescription, in addition to prescription and surgical methods, as well as counseling, follow-up care, and all needed services related to starting, ending or switching methods (such as removal of an IUD or implant). States should apply these and other protections to all Medicaid enrollees, whether covered directly by the state or through a Medicaid managed care plan run by a private-sector insurer. States should also bolster Medicaid coverage of important family planning–related services by requiring coverage for the full range of preventive care detailed in federal guidelines for the provision of quality family planning services.6,7 That includes counseling, screening and other care related to HIV, other STIs, cervical cancer, intimate partner violence and more. inappropriate quantity limits (such as covering only one IUD every five years, even if a previous device was expelled or removed for a planned pregnancy). Again, this would codify and build on current federal policy. Federal law prohibits cost-sharing for family planning under Medicaid. CMS regulations require that Medicaid enrollees be “free from coercion or mental pressure and free to choose the method of family planning to be used.”8 In regulations and guidance to states in 2016, CMS interpreted that requirement to prohibit step therapy for contraception, require coverage of contraceptive device removal and discourage inappropriate contraceptive quantity limits.2 CMS also severely limited the use of prior authorization for family planning by clarifying that patients must be free to choose a method based on criteria such as side effects, clinical effectiveness, whether the method is reversible, and ease of use. States, managed care plans and health care providers are required under current federal regulations to accommodate a Medicaid enrollee’s request to communicate via alternative means or at an alternative location (such as via e-mail rather than by paper mail delivered to her home address). States should codify this protection and strengthen it by proactively asking patients about their communication preferences. They should also review the standards and systems in place at state agencies and at managed care plans to identify and address potential violations of confidentiality. For example, they could require plans to suppress automatic notices that might accidentally reveal that a Medicaid enrollee received sensitive services. States should help protect access to providers by establishing strong “network adequacy” standards for Medicaid managed care plans. For family planning, this means requiring plans to contract with a wide network of safety-net health centers, as well as clinicians—both physicians and advanced practice clinicians—who specialize in obstetrics and gynecology. As a parallel measure, states should act to protect access to care outside of managed care provider networks, and for enrollees who are not in a managed care plan at all. Specifically, they should codify enrollees’ right to a free choice of any qualified provider for family planning services—even for enrollees in a managed care plan that otherwise restricts their insurance coverage to a limited network. Further, states should make it clear that because of this protection, enrollees cannot be required to obtain a referral for family planning care, regardless of whether the provider is in network or out of network. They should provide Medicaid enrollees with clear and timely instructions for how to access this care, and require Medicaid managed care plans to do the same. All of these protections are currently required under federal law and regulations. In protecting Medicaid enrollees’ choice of providers, states should also make it clear that they are protecting those providers from discrimination in their ability to participate in Medicaid. States should reaffirm that—as stated in a 2016 CMS letter to state officials—enrollees cannot be denied access to a provider solely because they offer the “full range of legally permissible gynecological and obstetric care, including abortion services.”12 States should also make it clear that plans cannot discriminate against safety-net family planning providers in other ways, such as by failing to provide timely or appropriate reimbursement for their services. The 2016 CMS letter came in response to attempts by numerous governors and state legislatures to bar Medicaid reimbursement to Planned Parenthood affiliates and other safety-net providers. Federal courts have sided with CMS’s interpretation of Medicaid law in every case decided so far. Yet, conservatives at the federal and state levels have persisted in their efforts, and it seems unlikely that CMS will continue to stand by its current interpretation of the law under the Trump administration. As a final step to ensure access to providers, states should revisit their protections and procedures for responding to the religious and moral objections of providers and plans. The goal should be to ensure that—despite any objections on the part of providers or plans to certain services, referrals or information—enrollees are never denied or delayed in receiving family planning and other reproductive health care that Medicaid covers. informing enrollees of their rights on a recurring basis. Protections for Medicaid enrollees’ choice of services and providers are only meaningful if people are eligible for coverage in the first place and can get and stay enrolled. Although conservatives in Congress and the Trump administration are looking to scale back eligibility and enrollment—by phasing out the ACA’s Medicaid expansion, instituting caps on federal Medicaid spending or setting up new eligibility restrictions—states can and should act as a countervailing force. Currently, there are 19 states that have not yet expanded Medicaid to cover low-income adults under the ACA.15 The option to expand coverage remains on the table, and several states have started to consider it again seriously. For example, the Kansas legislature passed a Medicaid expansion bill in 2017, and only narrowly failed to override a veto by Gov. Sam Brownback (R).16 Policymakers in Georgia, Maine, North Carolina, Utah and Virginia are also reportedly looking to revive expansion efforts.17 If states succeed in expanding Medicaid, that would provide full-benefit health coverage—including family planning coverage—for potentially millions of currently uninsured people. Those states that do not have an expansion in place—including several states that have rolled back expansions in recent years—should reconsider. Numerous studies have documented that Medicaid family planning expansions improve access to care, help women avoid unintended pregnancies and save considerable amounts of public funds by helping states avoid costs for maternity and infant care related to unwanted pregnancies.19 Moreover, these expansions can provide a limited safety net for state residents—albeit for family planning and related services only—if full-benefit coverage via Medicaid or the private insurance marketplaces is inaccessible or unaffordable. States should take all of these steps to protect and enhance Medicaid’s coverage of family planning care because family planning promotes the central goals of Medicaid. First, family planning services are effective preventive services that improve the health of women and their children—and improving health is Medicaid’s most basic goal. By helping women to avoid unintended pregnancies, contraceptive use decreases pregnancy-related illness, injury and death, especially for women who have medical conditions that may be exacerbated by pregnancy.22 And by helping women to plan and space wanted pregnancies, contraceptive use can help reduce the risk of having a premature or low-birth-weight delivery. In addition, pregnancy planning can help women address chronic conditions before they become pregnant and start prenatal care as early as possible in pregnancy. Moreover, the other preventive services offered as part of a family planning visit can help people avoid or address HIV and other STIs, infertility, cervical cancer, intimate partner violence and other negative health outcomes. Second, family planning care contributes to Medicaid’s goal of helping individuals and families be independent and self-sufficient. There is considerable evidence to document that family planning care helps people complete their education, get and keep a job, earn a better wage, and support themselves and their families.22 In doing so, it has advanced women’s equality and social justice in the United States. In sum, family planning care promotes the health and the social and economic well-being of women, families and society. States should take every step possible to protect and improve coverage of these services under Medicaid—regardless of what Congress and the Trump administration may do. 1. Guttmacher Institute, Uninsured rate among women of reproductive age has fallen more than one-third under the Affordable Care Act, News in Context, Nov. 17, 2016, https://www.guttmacher.org/article/2016/11/uninsured-rate-among-women-reproductive-age-has-fallen-more-one-third-under. 2. Sonfield A, CMS provides new clarity for family planning under Medicaid, Health Affairs Blog, July 12, 2016, http://healthaffairs.org/blog/2016/07/12/cms-provides-new-clarity-for-family-planning-under-medicaid/. 3. Hasstedt K, Sonfield A and Gold RB, Public Funding for Family Planning and Abortion Services, FY 1980–2015, New York: Guttmacher Institute, 2017, https://www.guttmacher.org/report/public-funding-family-planning-abortion-services-fy-1980-2015. 4. Food and Drug Administration, U.S. Department of Health and Human Services (HHS), Birth Control Guide, no date, https://www.fda.gov/downloads/ForConsumers/ByAudience/ForWomen/FreePublications/UCM517406.pdf. 5. Centers for Medicare and Medicaid Services (CMS), HHS, Letter to state Medicaid directors re: Medicaid family planning services and supplies, SHO #16–008, June 14, 2016, https://www.medicaid.gov/federal-policy-guidance/downloads/sho16008.pdf. 6. Gavin L et al., Providing quality family planning services: recommendations of CDC and the U.S. Office of Population Affairs, Morbidity and Mortality Weekly Report: Recommendations and Reports, 2014, Vol. 63, No. RR-4, https://www.cdc.gov/mmwr/pdf/rr/rr6304.pdf. 7. Hasstedt K, More than a pack of pills: the many components and health benefits of quality family planning, Guttmacher Policy Review, 2014, 17(3):2–8, https://www.guttmacher.org/gpr/2014/09/more-pack-pills-many-components-and-health-benefits-quality-family-planning. 9. Gold RB, A new frontier in the era of health reform: protecting confidentiality for individuals insured as dependents, Guttmacher Policy Review, 2013, 16(4):2–7, https://www.guttmacher.org/gpr/2013/12/new-frontier-era-health-reform-protecting-confidentiality-individuals-insured-dependents. 10. 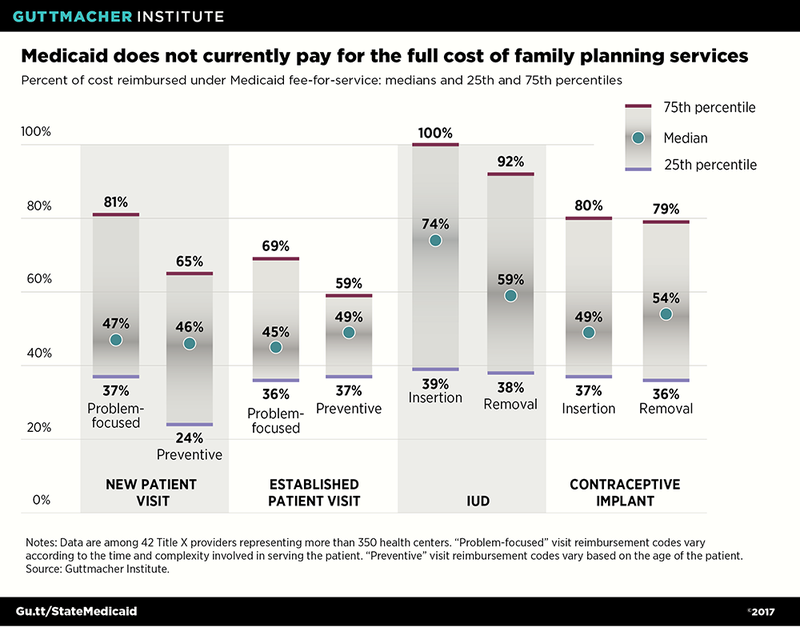 Hasstedt K, Recent funding restrictions on the U.S. family planning safety net may foreshadow what is to come, Guttmacher Policy Review, 2016, 19:67–72, https://www.guttmacher.org/gpr/2016/12/recent-funding-restrictions-us-family-planning-safety-net-may-foreshadow-what-come. 11. CMS, HHS, Medicaid and Children’s Health Insurance Program (CHIP) Programs; Medicaid managed care, CHIP delivered in managed care, and revisions related to third party liability, Federal Register, 2016, 81(88):27497–27901, https://www.gpo.gov/fdsys/pkg/FR-2016-05-06/pdf/2016-09581.pdf. 12. CMS, HHS, Letter to state Medicaid directors re: clarifying “free choice of provider” requirement in conjunction with state authority to take action against Medicaid providers, SMD #16-005, Apr. 19, 2016, https://www.medicaid.gov/federal-policy-guidance/downloads/SMD16005.pdf. 13. Decker SL, In 2011 nearly one-third of physicians said they would not accept new Medicaid patients, but rising fees may help, Health Affairs, 2012, 31(8):1673–1679, http://content.healthaffairs.org/content/31/8/1673.full. 14. Sonfield A et al., Assessing the Gap Between the Cost of Care for Title X Family Planning Providers and Reimbursement from Medicaid and Private Insurance, New York: Guttmacher Institute, 2016, https://www.guttmacher.org/report/assessing-gap-between-cost-care-title-x-family-planning-providers-and-reimbursement-medicaid. 15. Kaiser Family Foundation (KFF), Current Status of State Medicaid Expansion Decisions, Washington, DC: KFF, 2017, http://kff.org/health-reform/slide/current-status-of-the-medicaid-expansion-decision/. 16. Goodnough A and Smith M, Kansas House narrowly upholds governor’s veto of Medicaid expansion, New York Times, Apr. 3, 2017, https://www.nytimes.com/2017/04/03/health/kansas-brownback-veto-expand-medicaid.html. 17. Berman R, The states where Obamacare’s footprint might get even bigger, Atlantic, Mar. 29, 2017, https://www.theatlantic.com/politics/archive/2017/03/kansas-republican-states-expand-medicaid-obamacare/521124/. 18. 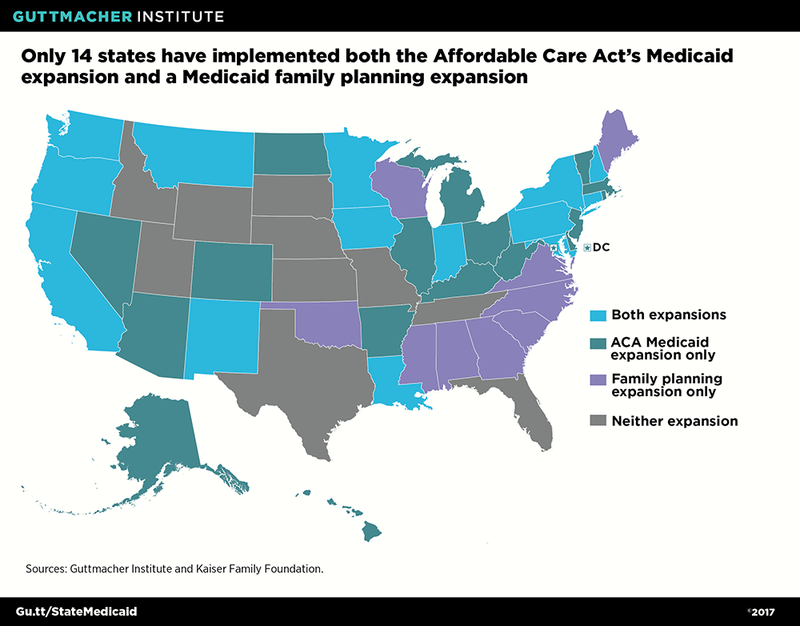 Guttmacher Institute, Medicaid family planning eligibility expansions, State Laws and Policies (as of May 2017), 2017, https://www.guttmacher.org/state-policy/explore/medicaid-family-planning-eligibility-expansions. 19. Sonfield A and Gold RB, Medicaid Family Planning Expansions: Lessons Learned and Implications for the Future, New York: Guttmacher Institute, 2011, https://www.guttmacher.org/report/medicaid-family-planning-expansions-lessons-learned-and-implications-future. 20. Center on Budget and Policy Priorities (CBPP), Medicaid Per Capita Cap Has Same Damaging Effects as Block Grant, Washington, DC: CBPP, 2017, http://www.cbpp.org/medicaid-per-capita-cap-has-same-damaging-effects-as-block-grant. 21. Ku L and Brantley E, Myths about the Medicaid expansion and the “able-bodied,” Health Affairs Blog, Mar. 6, 2017, http://healthaffairs.org/blog/2017/03/06/myths-about-the-medicaid-expansion-and-the-able-bodied/. 22. Sonfield A, Contraceptive coverage at the U.S. Supreme Court: countering the rhetoric with evidence, Guttmacher Policy Review, 2014, 17(1):2–8, https://www.guttmacher.org/gpr/2014/03/contraceptive-coverage-us-supreme-court-countering-rhetoric-evidence. 23. Sonfield A, Beyond preventing unplanned pregnancy: the broader benefits of publicly funded family planning services, Guttmacher Policy Review, 2014, 17(4):2–6, https://www.guttmacher.org/gpr/2014/12/beyond-preventing-unplanned-pregnancy-broader-benefits-publicly-funded-family-planning.